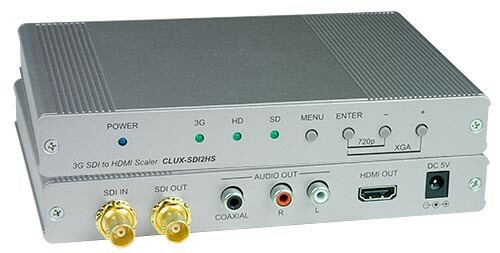 Broadcasts 3G-SDI/HD-SDI/SD-SDI signal from one SDI source to one HDMI/DVI and one SDI displays. Equalized and re-clocked loop output. Supports SMPTE 259 M (850 feet), SMPTE 292 M (958 feet), SMPTE 424 M (1,391 feet), SMPTE 425 M (1,394 feet) video interfaces used for broadcast-grade video. Supports all audio formats up to 8-channel. Sends audio through HDMI port as well as through a separate coaxial digital and RCA L/R analog output. Two female RCA (R&L) for analog audio.